Julia Haas is a McDonnell Postdoctoral Fellow in the Philosophy-Neuroscience-Psychology program at Washington University in St. Louis. Her research focuses on decision-making. Over the past two decades, computational and neurobiological research has had a big impact on the field of economics, bringing into existence a new and prominent interdisciplinary field of inquiry, ‘neuroeconomics.’ The guiding tenet of neuroeconomics has been that by combining both theoretical and empirical tools from neuroscience, psychology and economics, the resulting synthesis could provide valuable insights into all three of its parent disciplines (Glimcher 2009). And although some economists have resisted the influence of neuroscience research (Gul and Psendorfer 2008), neuroeconomics has by all measures thrived as a theoretical endeavor, and proven itself as a discipline capable of marshaling substantial institutional and financial resources. For example, theories from economics and psychology have already begun to restructure our neurobiological understanding of decision-making, and a number of recent neurobiological findings are beginning to suggest constraints on theoretical models of choice developed in both economic and psychological domains. 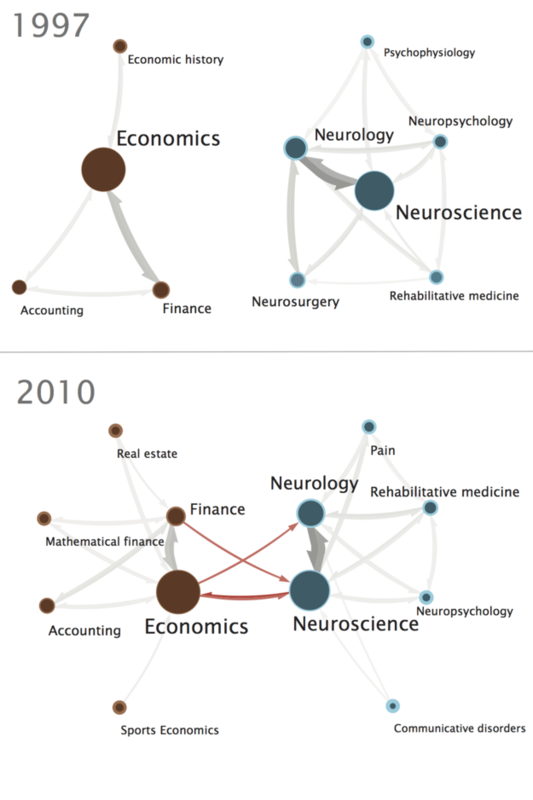 Similarly, a study by the Eigenfactor project at the University of Washington showed that while there were no citations from either of these disciplines to the other in 1997, by 2010, there were 195 citations from economics journals to neuroscience journals, and 74 citations from neuroscience journals to economics journals. This interdisciplinary partnership has caught the attention of the National Institutes of Health, which finances 21 current research projects with “neuroeconomics” in their descriptions, to the tune of $7.6-million. The agency gives out many more millions for other neurobiology work related to decision-making: Caltech got $9-million this month to establish a center in this field.